This is my first review for the 2010 Period Drama Challenge hosted by Lights, Camera…History! 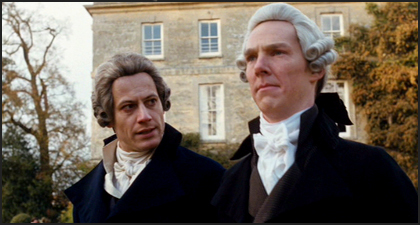 Set in the Georgian era, Amazing Grace tells the story of William Wilberforce (played by Ioan Gruffudd), a Member of Parliament who became a leader in the movement for abolition of the slave trade in Great Britain. Although discouraged by his latest defeat and physical ailment, Wilberforce is persuaded to tell the story of his anti-slavery campaign to the interested young Barbara Spooner (Romola Garai). The film then flashes back fifteen years to the beginning of Wilberforce’s political career. Initially unable to decide between doing “God’s work” or the work of a political activist, he is encouraged by his old Preacher John Newton (Albert Finney), a former slave ship captain who wrote the hymn “Amazing Grace”, and by his friend William Pitt the Younger (Benedict Cumberbatch), who at 24 became the youngest Prime Minister of England, that he can do both. Fellow abolitionists Thomas Clarkson, Olaudah Equiano, and Pitt’s political rival Charles James Fox (Michael Gambon assist him in this long quest, but they have powerful opposition that includes the Duke of Clarence and Banastre Tarleton. Wilberforce seeks John Newton's advice. Watching Amazing Grace for the first time I actually rolled my eyes at the opening scene. In it Wilberforce, although clearly unwell, stops his carriage and trudges through the mud to tell a driver beating his horse that if he leaves it alone it may recover. This is the audience’s first glimpse of Wilberforce and defending an animal seemed like such a cliche way to introduce him as the hero of the piece. Much to my surprise, this scene did actually occur! William Wilberforce was not only a noted lover of animals but a founding member of the Society for the Prevention of Cruelty to Animals (today the RSPCA). Obviously my opinion of the movie improved as it went on and Amazing Grace has become one of my favourite films. Although it’s a minor detail, as an admirer of William Pitt the Younger I both noticed and was impressed by the fact that Pitt almost always has a glass in hand. After an attack of gout at fourteen, a doctor advised the future Prime Minister that a bottle of port a day was the cure. He continued to drink excessively throughout his life and Henry Addington (Prime Minister between 1801 and 1804) commented that “Mr. Pitt liked a glass of port very well, and a bottle better”. 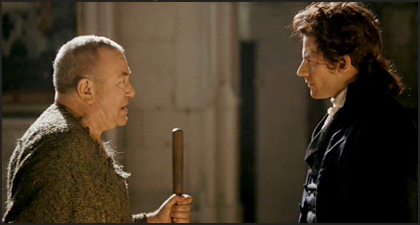 Wilberforce and Pitt discuss politics. An important turning point in the film occurs when Pitt throws a dinner party designed to encourage his friend to take on the abolition of the slave trade. Although a dinner did occur, it was organized not by Pitt but by Thomas Clarkson, who Wilberforce had already met. When asked to introduce the issue in Parliament, Wilberforce replied that he “had no objection to bring forward the measure in Parliament when he was better prepared for it, and provided no person more proper could be found”. Two months later he made his final decision to present a Bill and Pitt urged him on. One of the more interesting aspects of the film is Barbara Spooner, who is presented as a passionate intellectual equal. Unfortunately Spooner, while physically attractive, was actually timid and made a poor hostess. The whirlwind courtship, however, is true. Despite an eighteen year age difference, Wilberforce fell deeply in love with Barbara on sight. Just eight days after they first met he proposed. The wedding occurred six weeks later. Wilberforce tells his story to Barbara Spooner. Amazing Grace also casts Home Secretary Henry Dundas as something of a villain for his betrayal of Pitt and Wilberforce by inserting the word “gradual” into the motion for abolition. Yet Dundas was one of Pitt’s best friends and allies. Pitt biographer William Hague even suggests that “gradual abolition” was certainly discussed between Pitt and Dundas and may even have been Pitt’s fallback plan after outright abolition was defeated in the House. Amazing Grace is largely accurate, and those things it does change are lesser details, but I do have to wonder about the continued references to “Lord Charles Fox”. Fox always served in the House of Commons and never held the title ‘Lord’. Conversely, the Duke of Clarence (the future William IV), depicted in the House, was a son of the King and would have been a member of the House of Lords. Tarleton and Dundas are also given the title ‘Lord’ incorrectly. Other minor inaccuracies are the presence of Wilberforce at Pitt’s deathbed (unfortunately Wilberforce did not make it in time) and the last speech of the film, delivered in the House of Commons by Charles James Fox. Although it’s a lovely moment, Fox died only months after Pitt and was not alive in 1807 to give a speech praising Wilberforce. 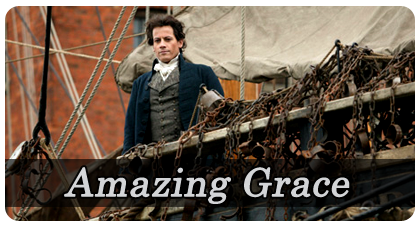 Amazing Grace isn’t the world’s best film but it remains one of my all-time favourites. The cast is great, including legends like Michael Gambon and Albert Finney along side the queen of period dramas Romola Garai, and I continue to find it very touching. It could easily be just a religious film but by downplaying some of Wilberforce’s evangelism it is spiritual without being preachy. Although it plays with dates and details, Amazing Grace doesn’t omit or change anything that significantly alters the story and is largely an accurate tale of the political battle for the abolition of the slave trade. It is a film initially about youth, and then about perseverance and I highly recommend it. The costuming in this film was great! I watched it about a year ago and was very surprised that I had never seen it mentioned on anyone else’s blog until now.